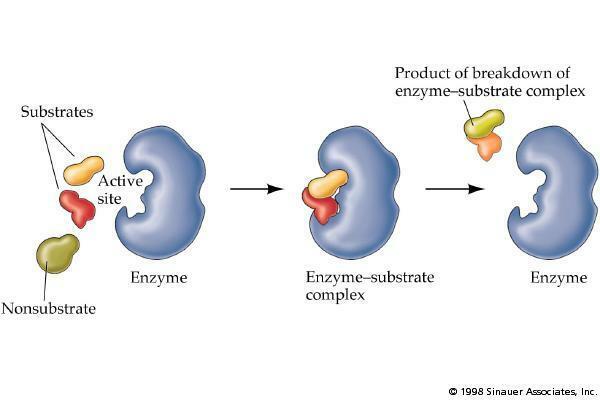 Leaving Certificate Biology (Enzymes) Note on Enzymes, created by eimearkelly3 on 08/08/2013. MetabolismMetabolism is the sum of all the chemical reactions that take place within an organism. e.g. growth, movement, maintenance of a constant internal state, repair, response to stimuli, and reproduction.The most important controllers of cellular reactions are enzymes.Sources of energySolar energy : sunlight e.g. absorption of sunlight by chlorophyll --&gt; photosynthesisCellular energy : sources of energy that are capable of being released by reaction within a cell. Enzymes are folded into globular shapes that will fit neatly and react only with a substance of a shape that matches the enzyme (complex 3D shape)Anything that changes the shape of an enzyme will reduce its efficiency to speed up a reaction.SUBSTRATE : The substance with which an enzyme reactsPRODUCT : The substance(s) the enzyme forms. Factors affecting enzyme activityTemperature....At very low temperatures (0 degrees for water) ice forms. The cell contents become solid and enzymes cannot work.As the temperature increases from 0 degrees the rate of molecular movement increases. This causes the substrate molecules and enzymes to 'bump' into each other more often --&gt; rate of reaction increases.Human enzymes are designed to work at 37 degrees while most plant enzymes prefer 20-30 degrees.Above a certain temperature, enzymes begin to lose their 3D shape. Consequently, the rate of reaction falls.When the shape of an enzyme is fully lost (above 50 degrees) the enzyme is said to be denatured (has lost its ability to function).PHEnymes work over a very narrow PH range. For most enzymes this is PH 6-8. (optimum 7) *Pepsin in the stomach has an optimum PH of 2.Enzyme activity is also affected by the enzyme-substrate concentration. Active siteThe active site is the part of the enzyme that combines with the substrate (was referred to as the lock and key hypothesis as the active site was believed to be rigid in structure).It is now known that when the substrate enters the active site, the active site changes shape slightly to form a more precise fit around the substrate. 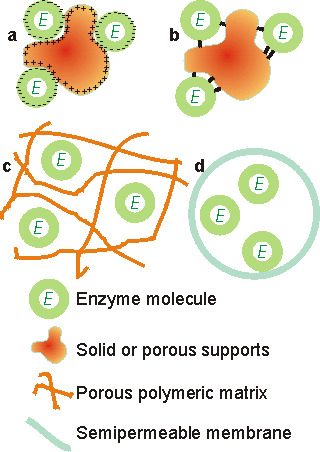 This is referred to as the INDUCED FIT MODEL of enzyme action. Immobilised enzymes are enzymes that are attached to, or fixed to, each other or an inert material.Immobilised enzymes are not free in solution. 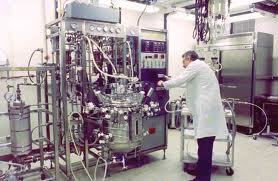 BIOREACTORA bioreactor is a stainless steel vessel used to produce useful substances from the activiies of biological agents. Uses of immobilised enzymes: penicillin acylase --&gt; alters the structure of penicillin to produce a wider spectrum antibiotic. glucose isomerase --&gt; converts glucose to fructose which is used to sweeten soft drinks. lactose --&gt; used to convert lactose into sweeter tasting sugars (glucose + galactose). These products are used to replace condensed milk in the manufacture of soft toffee and caramel.